follow me home: a little of this, a little of that and a GIVE-AWAY! a little of this, a little of that and a GIVE-AWAY! I have been overwhelmed by the kindness of friends (both old and new) who have had so many sweet things to say about the new shellybean bags. To say that making the bags has been therapeutic for me would be a huge understatement. I take all of it with a grain of salt, knowing that it will never make me monetarily rich. Instead, I am creatively fulfilled. I've reconnected with and gained new friends. I've smiled knowing that the small acts of having contests or donating bags can make others happy. I am at peace and am forever grateful for the opportunities afforded me. I'm genuinely excited to imagine what's ahead. My personal lesson throughout the journey of the past few years? I've learned that being kind to each other never gets old. Let's face it. There are some unhappy people out there. There are some mean people out there. All of us have been there. I have been there. I have been unhappy. I have been unkind. One of the greatest lessons I have learned is that the former does not give permission for the latter. Someone always has it worse off than us even on our worst days. Some of the bravest people I know have faced loss or unfair, cruel pasts; yet these very people are amazing in finding some positive ways to grow. I've come to see that finding some positivity in each day, laughing with others, smiling and using kind words to hold up each other can only do good. It's not being naive. It's not spreading fake, sugary rainbows all over the world with your eyes closed. It's the very opposite of being blind to the world. It's putting others before yourself. It's saying an extra nice thing to one person so they may do the same to someone else. Why would anyone be cruel when we're all fighting the same fight? It's what your mother probably told you or what your teacher tried to teach on your very first day of school. If we can't find good in ourselves some days, it should be our job to find it in another person and let them know. It's been such a long road for many of us. I for one am looking forward to what tomorrow brings. I have everyone who is in my world today to thank for that. Now, enough of the sap. Let's get onto the giveaway. Once again, it will be a drawing. The drawing will close on Friday at eight p.m. mountain time. 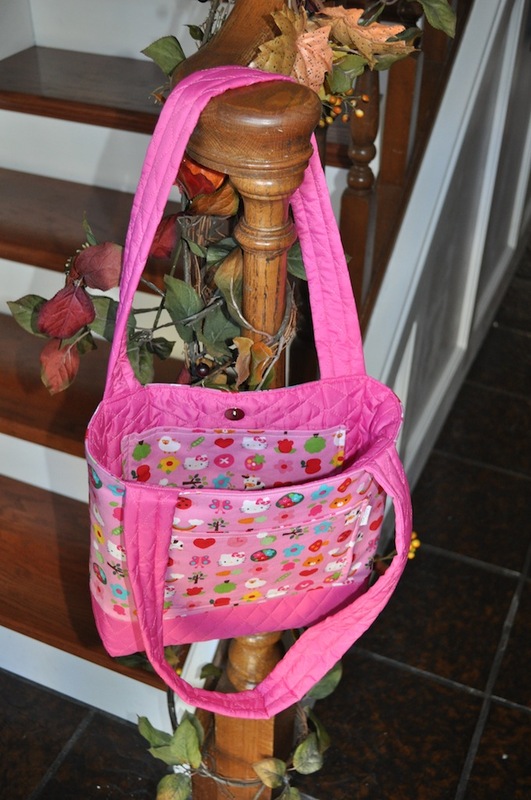 This bag is a kimmi-bean bag made of polyester quilting and Hello Kitty Fabric. I usually work to get copyright permission to sell registered merchandise, but I'm not selling it. I'm giving it away! She is 13"wide X 9" tall and 4 inches deep. the kimmi-bean has 4 pockets- 1 in the front, two inside and a zippered pocket on the back. The purse is secured with a metal snap and has 4 very cute purse feet to hold her up. Give her a happy home, won't you ? 1. Leave a comment telling the "high and low" of your day. What was the best and worst part of your day today? 2. If you're new to this blog, please, please still enter the contest. 3. As usual, if this isn't the bag for you or you can't think of someone to give it to, DON'T ENTER! If you were brought to the blog from the advice of a friend, be sure to leave their name in your comment. You will both be entered in the drawing. Bring as many friends as you like. You can be entered as many times as your name is mentioned. 4. Don't forget, if you're entering as an "anonymous" person, please leave your name or e-mail. Any Questions? Ask away in the comment section here or on our FB page. You can "like" the page to keep up on new products, sales or give-aways. FB is a little funny about contests, so I always hold them here on the blog. I'll leave the first comment as an example. The low of my day? Well, our family has learned the hard way that there are some really bad people that derive pleasure from hurting little girls. But the high? Realizing that someone much greater is in charge and looking out for us....a long lost friend showed up on my doorstep with a gift and a hug. She didn't even know anything had happened. It was just what I needed. And the band concert was pretty great, too....especially the ice cream with family afterward. I came here because it always makes me smile. And Hello Kitty? Well, who doesn't like her? The bag is adorable! The low of my day? hmmm where to start? The high of my day? I'm so very glad we've reconnected! I got the bag in the mail and I'm dying because I know it was delivered to Shawn's and I can't open it yet. I even saw the box sitting on the table when I stopped over last night, but youngest daughter was with me, so all I could do was to turn over the box so she didn't get nosy and read the return address! I can't wait to open it tonight! My best and worst was from a couple of days ago. Monday night, to be exact. Girls can be mean when there are boys around, and even as they get older and more mature they still have a competitive streak that needs to be kept in check. While out on a date (having a terrific time) with my guy, I did the worst possible thing and checked my phone. Worst moment: a text from my 21-year old (see, even older girls can be mean) saying, "I'm crying on the couch because of what my so-called friends are doing". My heart sank. It doesn't matter how old they are, as the Mom, we want to go hug our kids and put those mean kids in their places! Best moment: when I read the next text from my daughter which said, "Nevermind, I talked to ~insert name of best friend who is away at school~ and things are all better now. I'm so glad that my daughters are learning the importance of surrounding themselves with friends who lift them up and help them see the best in themselves and those around them. Best part...being a comment whore on facebook. Sharing said worst of my day on Facebook and brining home the comments...ha ha ha... I love you SHELLYBEAN!!!! High-so far, reading your wonderfully, optimistic comments about being kind to others. Thank you for reminding everyone that we don't have many choices in life, but we do have the choice of being kind. Low- so far, being sad and missing my college sophmore today. Breaking into silent tears for no reason other than I miss having him around. You can take the boy out of the house, but not the boy out of your heart. Being a mom doesn't ever stop, even when you aren't needed as much. I'm only half-way through my day, so I'll base it on that. Worst part: trying to shower using only one hand, due to the new presence of stitches in the other, which must be kept dry. Don't worry, it's nothing serious and isn't my "wiping hand" (thanks to Jonah, I did think about that very issue). Best part: just chatting with my husband over very mundane issues. I love being married to my best friend. Another anticipated best part: going to Puppy Kindergarten class tonight with Matthew and puppy Jackson. The low of my day? Wii says I've gained three pounds and a little monster who has not slept more than two hour a night, in nearly a month. The high? Eating the best brownie ever, in the peace and quiet of my shower this morning. It's the little things. I love this bag, BTW! the low part of my day (like most days) was being at work away from my family. The best part was having the whole family (including the dog) pick me up and seeing 4 happy smiling faces. Hope you have a great night Shel! The high of the day for me was coming home to my wonderful family. The low is going to bed knowing that it will be another 20 hours before I get to spend quality time with them again. We do have another long weekend coming up and I look forward to carving pumpkins, eating candy corns and singing Halloween songs. Ok, mostly the eating candy corns part, but it will all be fun. If a win the Hello Kitty bag can I take it out trick-or-treating? Oh my....what to say after reading all those great posts!!!! Let's see....the low of my day (I'll use yesterday) was waking up to the most awful back pain yet and deciding I really did need to spend the money ....most of which we don't have...to see the chiropractor who, BTW, tangled me up into a HUGE pretzel and hurt in more ways then I can say here!! ugh! The high, well...some guy tangled me up like a pretzel! HA! Like Kimmi said "it's the little things..."
Actually, my high of the day was just spending time with my 3 favorite boys. I love them sooo much!!!! Even if I don't win your amazing Hello Kitty bag, I want you to know how much I enjoy reading your blogs and writing things back to you. I miss you bunches!!! New Bags in the shop..Go! Go! Go!